Tyler Cavanaugh (#34) double-doubled... in the first half! 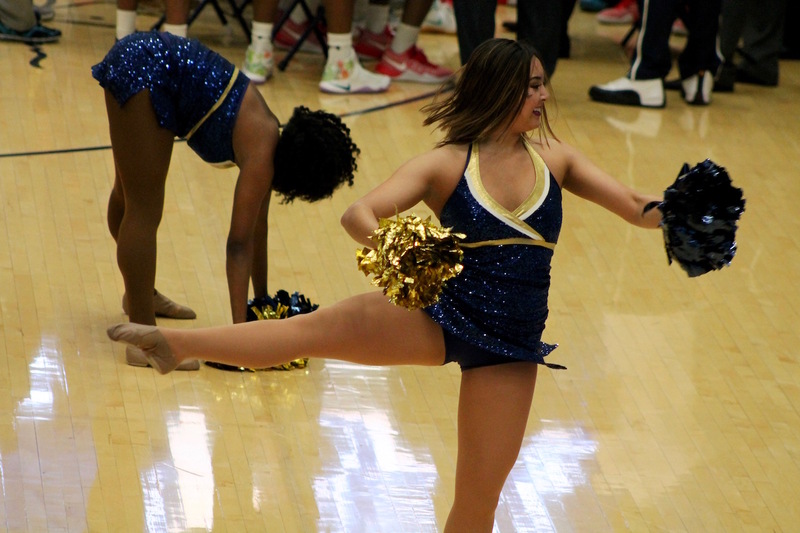 In a Saturday matinee at the Charles E. Smith Center, the George Washington men's basketball team welcomed local foe Howard, and subsequently dismissed the Bison with a wire-to-wire 79-62 win. 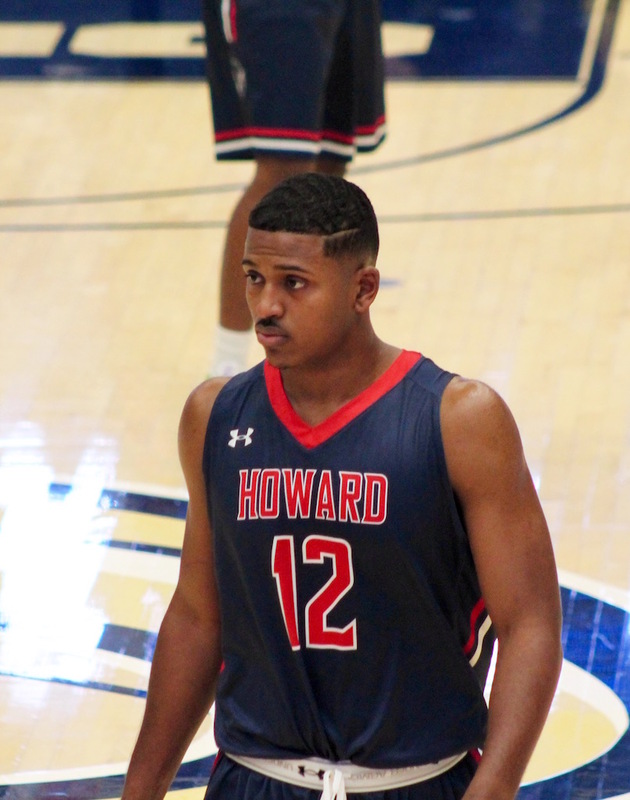 The Colonials improved to 7-4 on the season with the victory, while dropping Howard to 1-7. 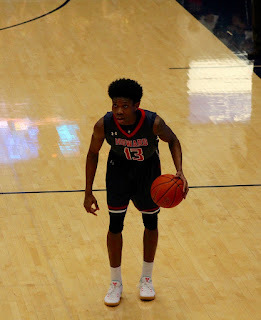 Jaren Sina took control of the game from the outset as he canned a career high five three-pointers before halftime, en route to 16 points along with three assists against zero turnovers before the intermission alone. 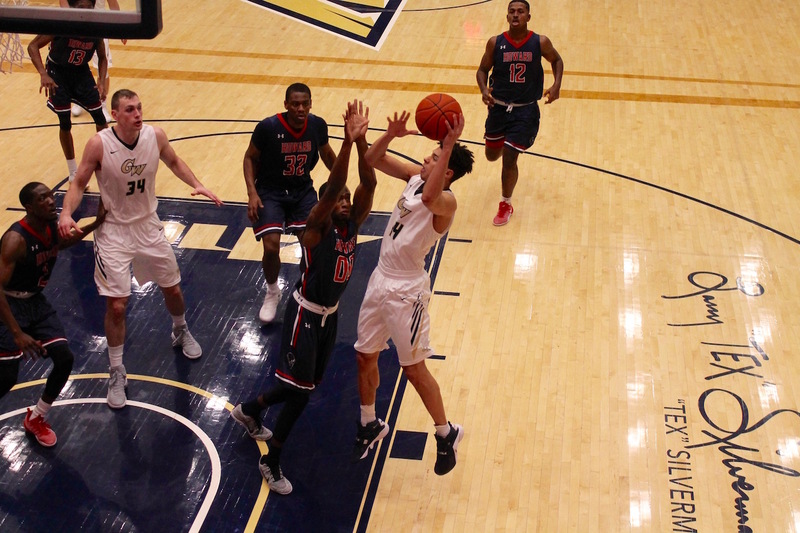 Tyler Cavanaugh double-doubled in the first half, as his 11 points and 10 rebounds in the opening stanza pushed the Colonials to a 43-34 edge at the break. 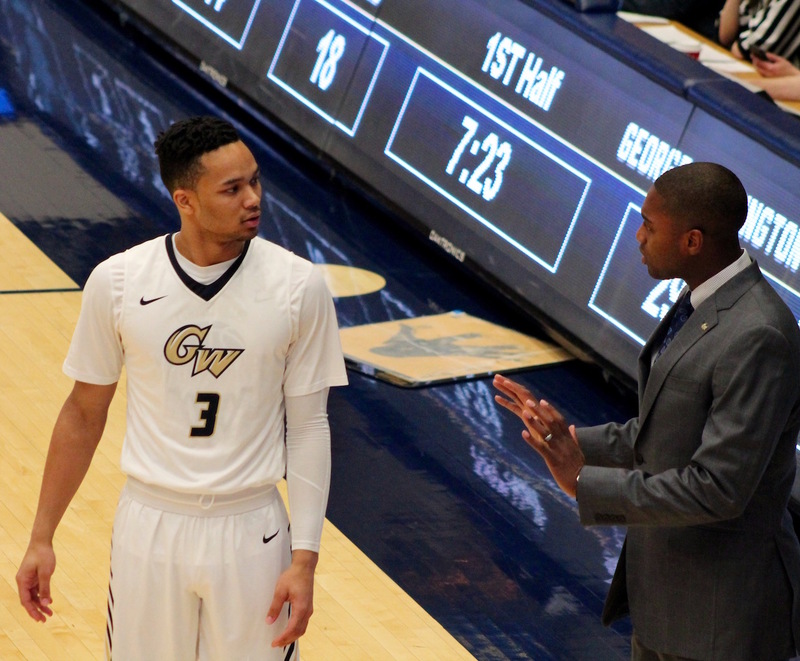 The first half saw GW shoot 15-of-27 from the floor (.556), including 9-of-14 from three-point range (.643), while assisting on 13 of the 15 buckets to take a 43-34 lead into the locker room. 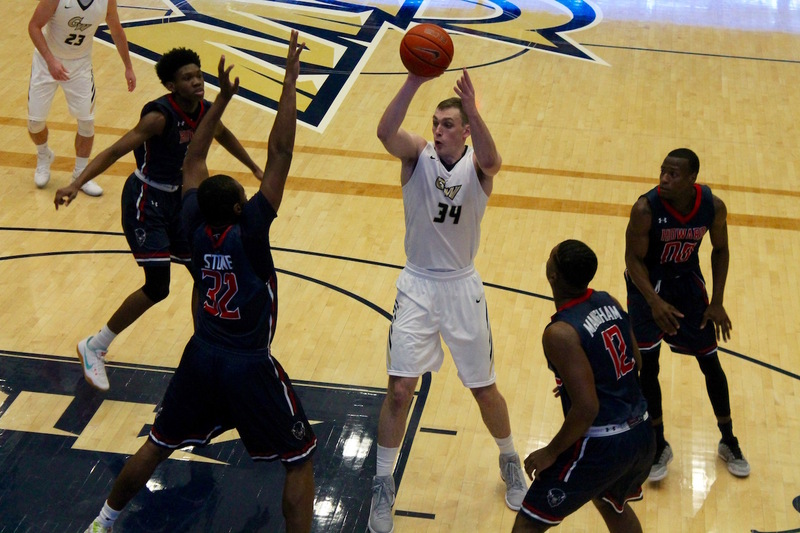 The Colonials led by as many as 20 in the second half before settling on the 17-point margin of victory. 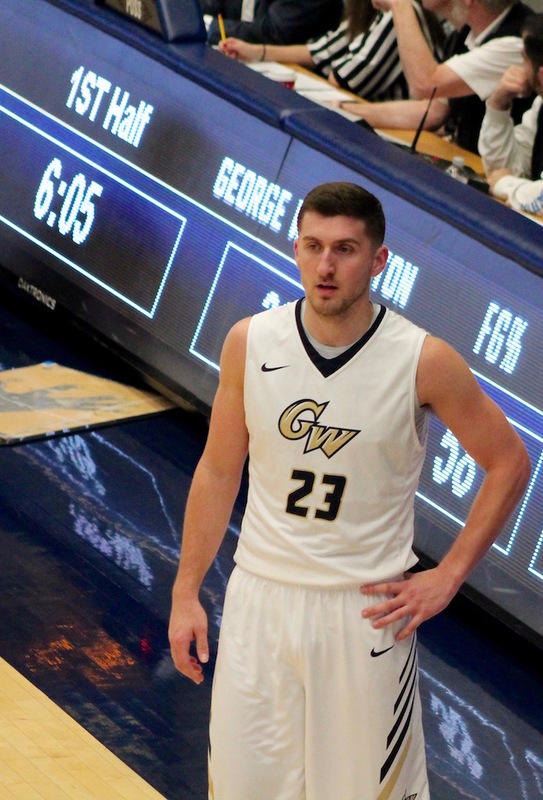 For the game GW registered a season-high 20 assists on 23 field goals, led by Cavanaugh's six dimes. Sina finished with five helpers, while Matt Hart dished three without a turnover for the Colonials' cause. Sina's hot shooting was contagious as well, as GW buried a season-best 13-of-26 (.500) from long range in the game, with five Colonials connecting on a three, including freshman walk-on Adam Mitola who put his name in the NCAA scoring books with a second half three. Sina ended with a career-high 20 points, with his five threes combined with a perfect 5-of-5 showing at the free throw line, leading a GW effort that drained 20-of-23 free throws (.870). Cavanaugh's afternoon included a line of 13 points, 13 rebounds and six assists overall, while Jordan Roland was the third Colonial in double figures with 11 in the scoring column. 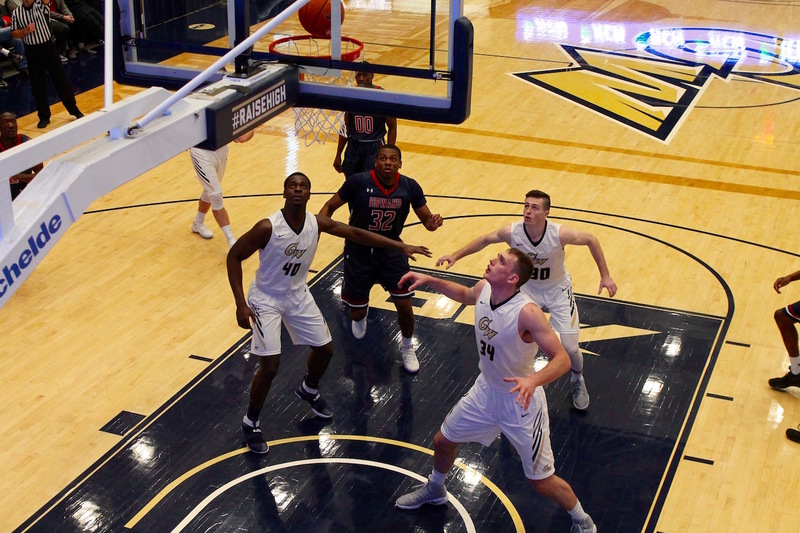 Howard was led by Charles Williams' game-high 27 points, and Solomon Mangham contributed a double-double with his 11-point, 10-rebound outing, but the Bison were limited to 20-of-60 shooting (.333) by the Colonials' defense, including just 23.5 percent in the second half. GW also outrebounded Howard 41-31 as all 11 Colonials who were active for the game (Yuta Watanabe and Patrick Steeves did not dress) grabbed at least one carom. The win capped an impressive week for the Colonials, who won at Temple on Wednesday despite playing their third game in five days and being without Watanabe and Steeves. Up next for GW is a Thursday night date with UCF at home at 7 PM. 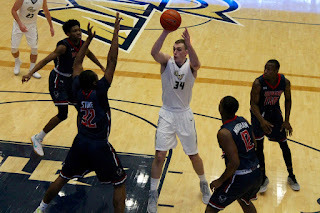 Last year in Florida, the Colonials were victorious against the Golden Knights, 67-50.